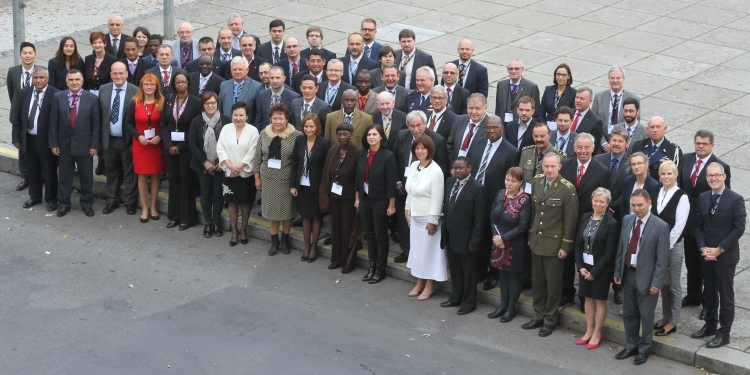 The 7th International Conference of Ombuds Institutions for the Armed Forces (ICOAF) on “the role of ombuds institutions for the armed forces in democratic societies” was held in Prague (Czech Republic) from 25 to 27 October 2015. The 7th ICOAF was co-hosted by the Czech main Inspector for Protection of Human Rights and the Geneva Centre for the Democratic Control of Armed Forces (DCAF), with the support of the Ministry of Defence of the Czech Republic and the Swiss Federal Department of Defence, Civil Protection and Sport (DDPS). The meeting promoted the exchange of experience and deepened cooperation among ombuds institutions. Together with old and new institutions from 37 states, EUROMIL was the only non ombuds institution participating at this meeting. The programme included panel discussions and breakout groups on topics such as the role of ombuds institutions for the armed forces and the centrality of human rights in democratic societies. Civil and political rights of armed forces personnel: citizens in uniform? The debate on this topic was conducted in several breakout groups on different issues including freedom of expression, freedom of association, the right to complaint and political rights. The breakout group on the right of association was moderated by Caroline Henrion, Policy Manager of EUROMIL. The group discussed the varying degrees of restrictions on the right of association for military personnel in different countries. While armed forces personnel enjoy full trade unions rights in some states, others are still prohibited from joining or setting up professional military associations due to the requirements of service. The group nevertheless agreed that the right of association, together with other civil and political rights, is intrinsic to democratic societies and recognized in all major international and regional human rights instruments. Restrictions to the right of association for military personnel should therefore be prescribed by law, necessary, proportionate and non-discriminatory. The information that easing certain restrictions is currently being considered in some countries was warmly welcomed. In addition to international standards, best practices and recommendations from specific regions and countries were highlighted. The role of states to create an enabling environment to ensure that members of the armed forces can join a professional association or a trade union representing their interests, both in legislation and in practice, was particularly emphasised, as well as the need to establish a well-regulated system of cooperation among the military and political leadership, ombuds institutions, military associations or unions and the civil society at national level. A good collaboration between ombuds institutions and professional associations or other NGOs – especially in countries where professional associations are non-existent – is of high importance in democratic societies. Public involvement in democratic oversight is crucial to ensure accountability and transparency across the security sector, in particular in the armed forces. The engagement of civil society in the security policy domain strongly contributes to accountability and good governance. Civil society acts not only as a government “watchdog” but also as an index of public contentment with the performance of institutions such as the armed forces. Looking at the goals of military associations or trade unions and those of ombuds institutions, one could ask whether “ombuds institutions and military associations are partners or competitors?”, stated the President of EUROMIL, Emmanuel Jacob, in his opening presentation on the subject during one of the sessions. Looking closer at the goals of ombuds institutions and representative staff associations, both strive for independence and impartiality. The effectiveness of both depends on trust and respect towards the institutions, namely the “armed forces” and the state in a broader context, as well as towards the people, the citizens. And soldiers are “Citizens in Uniform” – a principle EUROMIL defends since 1972. Ombuds institutions should try to improve the relationship between, in this case, members of the armed forces and the administration – here: the defence staff – and, depending on the subject, the political leadership or the minister of defence in particular. They should avoid unnecessary and unwanted conflicts but promote solutions, wherever possible, for all concerned parties. Military associations and trade unions should act following the same principles and goals. A good relationship build on mutual trust and respect is the basic element for a successful social dialogue that will be beneficial for the individual soldier – and in extension his/her family – as well as the armed forces as a whole. Ombuds institutions as well as staff associations are crucial elements of public involvement in the democratic oversight of armed forces. Together they can and should play an important role in ensuring that the armed forces act in accordance with the rule of law and with respect for human rights and fundamental freedoms. In this context, it is important to guarantee that every single member of the defence forces is granted human rights and fundamental freedoms. How can someone ask soldiers to defend or reinstall human rights and fundamental freedoms in all parts of the world, when they themselves do not enjoy these rights and freedoms in their everyday life? It was concluded that regional organisations can play a very useful role in promoting and ensuring democratic oversight of the armed forces. Moreover, it was noted that there still remain gaps in capacity and limits to the resources to fill these gaps. Therefore, DCAF was requested to facilitate capacity building exercises between ombuds institutions. The 8th ICOAF is planned in October 2016 in the Netherlands.